The implications of the latest survey of the City of London’s culture are stunning. The study by University of Notre Dame and a law firm revealed that nearly a fifth of respondents believed that “financial service personnel must sometimes engage in unethical or illegal activity to be successful in the current financial environment”. It found that there had been a “marked decline” in ethics over the last 2 years and, most worryingly of all, that half the respondents regarded law enforcement and regulatory authorities as ineffective in detecting, investigating and prosecuting securities violations. In the US the survey findings were even more disturbing: a quarter of US respondents admitted they would use insider trading to make a guaranteed $10m if they believed they could get away with it. So since regulation has patently failed, what should now be done? This regulatory ineffectiveness is all the more remarkable given the size of recent penalties imposed. Last year the Financial Conduct Authority levied a record of £1.4bn of fines, largely accounted for by the £1.1 bn paid by 5 banks to settle charges over manipulation of the foreign exchange market. In this year Barclays alone is expected to pay out some £2bn over this same issue. These are enormous sums, but what the attitudinal survey clearly shows in the light of the magnitude of these fines is that the bankers have decided they’re acceptable as the price for continuing with business as usual. That reinforces the failure of regulation when at the same time the banks, the most powerful lobby in the country, have already begun a major pushback against any further regulation and are hand in pocket with the new Tory government, half of whose party funding they supply. Further, stronger regulation may be called for, but is unlikely to make any radical change to the culture since the fines are effectively collected by the shareholders whilst the boardroom, the perpetrators, act with impunity. One is to prosecute the lawbreaker executives and if found guilty, then depending on the gravity (or regularity) of the offence, either disqualify them from any further employment in the finance sector or send them to prison for a stiff sentence – remembering that benefit fraud on a comparatively trivial scale still receives a custodial sentence. 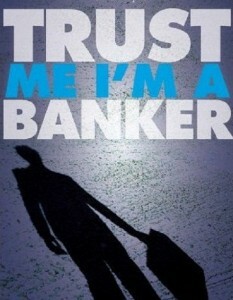 The other solution is to recognise that the private banking model is now so irreversibly broken and contaminated that the Big 4 should be broken up, a regional network of specialist banks serving industry like the German Mittelstand be created, and an ethical code of conduct be incentivised and enforced. Yesterday the American law enforcements made a statement which really did make me laugh. They said these fines will ensure that anyone who breaks the laws can expect us to come down hard on them, nobody can now expect to get away with breaking the laws. We are now going to fine a number of banks which will show others that you will not get away with breaking the laws. So which person will be paying these fine and since we are talking about Billions here, how many bankers can we expect to find in jail, answer on the back of a stamp, none. These fine are the yank ways of trying to recover some of the loses but the people who schemed and did these scam are walking away free totally completely free for god sake. But do not worry I will be the one and millions like me who will be the people who will suffer. What a bloody scam, I wonder why none of those bankers are jailed is it because they would state which politicians knew about it. I’d argue strongly that the only real differences between the often criminal, actions of the members of the banking fraternity and those of our many thieving, greedy and thoroughly dishonest MP’s, (Balls, Burnham Cooper, Miller, Laws, et al spring immediately to mind) are those of scale and opportunity. The biggest and most persistent bias/prejudice and the root of so much that has gone awry with the British Labour establishment is the frankly very common middle class prejudice that; of course it’s not wrong when we do it, only when some else does. But particularly when it’s someone we think we don’t like. But why is dishonesty so bad anyway; if pretty much everyone’s on the fiddle ? Not because of some spurious moral value judgment; it’s bad, (and dangerous to all of us,) on purely practical grounds; because complex operational systems from Russian, (and other,) nuclear reactors, to NHS hospitals to CIA risk assessments as precursors to misguided military action, to the banking debt, (escalating and out of control,) concealed typically by Lehman Brothers depended entirely on honesty to correct and control the kind potentially catastrophic systems cited above. Few things for example have done quite as much damage and discredit the already dubious case for climate change, (for example,) as the fact that East Anglia University had almost certainly falsified their findings and skewed their data to support the conclusions they thought they wanted. Of course bemoaning the lack of personal and professional integrity and particularly of the richest and the most powerful is as old as the hills. Corruption, graft and dishonesty are probably just as old as the human species, however what is different today are the scale and extent of their consequences. Every one still one likes to pretend that the crash was essentially a victim-less catastrophe and that no one, (or no one that mattered,) was really hurt or much damaged by it. In fact simply looking at current social, political and economic state of Greece and Spain alone, (probably not even the worst, but which usefully illustrate my point,) where they can’t even pay people pension’s reliably or here in the UK where our sick , disabled and our unemployed are being hung out to dry; to steal or starve, I have to wonder just how many ordinary people these crooks have murdered? You know you really should stop muttering to yourself JP, it makes you appear an even bigger nutter than you probably are. Kind of you say so. So have you anything remotely useful, interesting or relevant to add ? Yes my heart was broken 3 times during the election. Firstly we lost. And agreeing with Wolfgang Streeck in New Left Review that the rich and powerful haven’t a clue what to do about the global financial crisis and quantitative easing has only bought off the financial crisis for 2 years, I was concerned that we had Timid Labour . But many of us worked our socks off for Labour because we knew working class people and the poor would be crushed (and the progressive middle class would be hit too). Secondly, I usually score a few hits against he Tories in letters in the papers and on social media but the Tories had hired a US Democrat social media guru to counter any criticism of the Tories on social media (probably with comments from ‘fake citizens’) via his computer programme, my individual posts slaughtered the Tories on the reasons for the financial crisis etc. but my democratic flame was crushed by a computer programme. Thirdly, I would argue the biggest mistake of Marx was not to realise that the capitalists and their apologists would not react to his brilliant ideas – bloody hell we better do something about these ideas! So I actually believe the rich and powerful in the World actually talk, and organise, for their intersts, and I believe Saudi oil etc. (their pals) took a short hit to reduce oil prices for people to feel a bit better (without feeling the need for pay rises as Neo Liberalism has painted itself into a corner) and now the election is over and oil prices rise! A victory for the international upper class welfare state and a tripple whammy! As a member of LRC I have posted my ideas on John Mc Donnels radical debate website and will post here. Keep hope alive! X, Peace & International Solidarity!